I really do not know what caused the cardiac birth defects in the mother who returned to Brazil in her third trimester. However, according to the following article, congenital infection with Trypanosoma cruzi is a real hazard in Bolivia. Furthermore, congenital transmission occurred predominantly in newborns with a gestational age of 26 to 37 weeks. TWIP is my favorite of all your podcasts and of all of the medical podcasts in my queue. (One birding show and one financial show come sort of close.) Thanks for all the work you put into TWIP. Trans R Soc Trop Med Hyg. 1985;79(2):176-80. Congenital Chagas’ disease in Bolivia: epidemiological aspects and pathological findings. We are done with this year’s hurricanes and volcanoes and are enjoying nearly forgotten fall Kona weather. I’ve had the privilege to work with the wonderful people of the Bolivian altiplano from 1992-1993, and anytime you have cardiac symptoms from this region, you have to be suspicious of Chaga’s disease (American Trypanosomiasis); in this case congenital chagas, which while rare in the US, is not un-common in Bolivia. The most sensitive test for to confirm congenital and acute Chagas disease is the T cruzi PCR assay. Possible false positives from the mother’s antibodies can be reduced by repeating an early positive PCR test when the infant is over 9 months. Of course spotting T cruzi trypomastigotes in cord blood or in the infant’s blood would confirm the diagnosis but that’s often much less sensitive than molecular detection. Early treatment of acute congenital infection can have a cure rate of greater than 90% and can prevent severe complications of chronic Chagas disease. Either benznidazole or nifurtimox can be used for treatment, and both of them are generally well tolerated. However, a good differential would have to include Trichinella spiralis, Toxoplasmosis, filariasis, amebic pericarditis – perhaps as a complication an amebic liver abscess, Hydatid disease, and beyond parasites, perhaps cytomegalovirus, herpes simplex virus and rubella. Ascites often means cirrhosis. Have seen a lot of ascites in the southern Philippines from Schistosoma japonicum, and from Strongyloidiasis from S. fuelleborni in Sub Saharan Africa, but neither live in Latin America. Amebic liver abscess and amebic pericarditis would possibly have leukocytosis, but probably not eosinophilia. I’m sticking with Chagas Disease. Again, thank your for your continued investment of your time and passion in producing these wonderful podcasts. The Bolivian neonate with a pericardial effusion, ascites, and a patent ductus arteriosus. Elevated WBC, slight lymphocytosis, normal eosinophils. Mother has been traveling back and forth from USA and Bolivia, most recently during the third trimester. A case redolent of congenital parasitosis. Consult my notes and references for a further fatiguing discourse about the terms hydrops and dropsy. Hydrops fetalis is a syndrome, an aggregation of clinical signs that are the end result of multiple specific diseases. Historically the most common cause of hydrops was Rh disease, which was greatly reduced by the introduction of Rh immunization (RhoGam) beginning in 1968. Immune related hydrops still occurs, most frequently in alpha thalassemia major with hemoglobin Barts. Non-immune hydrops fetalis (NIHF) is now the most common category of this condition. The mechanism of fluid accumulation is complex; consult the below references if you want to dig deeper into this watery topic. There are multiple causes of NIHF, but the one that concerns us here is infection. A variety of congenital viral and bacterial infections can cause NIHF, most commonly parvovirus B17 and CMV. Less frequently, fetal infection with syphilis, tuberculosis and listeria can result in hydrops. Now that the preliminaries are disposed of, I will move into parasitic infections that can potentially result in a clinical scenario similar to our Bolivian baby. Entamoeba histolytica: congenital infections have been described. I can find no evidence that this infection causes hydrops. Malaria: According to the CDC Yellow Book there is malaria transmission in Bolivia (culprits: P. vivax 93%, P. falciparum 7%). Hydrops due to congenital malaria has been described (see REF) but is extremely uncommon. Neonates with congenital malaria are usually healthy at birth (REF). The mother in our case is reported to be well, so we can reasonably exclude malaria as a consideration. Leishmania (visceral)- Though Bolivia is reported to have the highest incidence of cutaneous leishmaniasis in the world, visceral leishmaniasis (Leishmania chagasi) is rare in Bolivia. Autochthonous cases have been described but are more common in Brazil (see Desjeux ref). Congenital visceral leishmaniasis has been reported from Brazil but is uncommon and I could no literature on associated hydrops. I think that this diagnosis is unlikely for our case. African trypanosomiasis- Note that this can cause congenital infection. Not relevant here. Trypanosoma cruzi: Carlier’s 2002 review states that maternal-fetal transmission of T. cruzi ranges from 2-12% of pregnancies in Bolivia, Argentina, Chile and Paraguay. Hydrops has been described but seems to be quite uncommon. Though congenital Chagas disease is an important cause of neonatal morbidity, the clinical presentation usually described as subtle or asymptomatic, however, up to 10% of vertically transmitted infections can manifest symptoms in the neonate. Screening infants in endemic areas is importance since congenital infection has the same potential to cause chronic disease as vector acquired infection. Diagnosis: serology, Western blotting, PCR, direct parasite visualization in blood or tissue (which have poor sensitivity). Rapid diagnostic tests: an indirect hemagglutinin test and TrypanosomaDetect, immunochromatographic strip assay. Accurate and high sensitivity diagnosis however remains a problem in low resource countries. Treatment is benznidazole (though only FDA approved for ages 2 and over) and nifurtimox (available through the CDC). According to the CDC cure rates in infected infants exceed 90%. TWiP case 161 is similar to one reported in MMWR in 2012, where a 31 y/o Bolivian woman living in Virginia gave birth (Caesarian) to a child with ascites, pleural and pericardial effusions (described as fetal hydrops). Other relevant infectious diseases were ruled out. 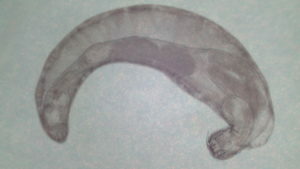 T. cruzi was seen in the neonate’s peripheral blood. This was the first reported case of congenital Chagas disease in the United States. Congenital Chagas disease is a strong contender for the cause of our patient’s clinical presentation. Toxoplasmosis: I could not locate epidemiologic data regarding congenital toxo in Bolivia, but a review from 2000 estimated that prevalence in Brazil is 1/3000 live births. Fortunately, the majority of these laboratory detected infections were subclinical. (The relatively high Brazilian prevalence is compared to Massachusetts, where the estimate was 1/10,000 live births.) A large 10 year Brazilian survey states that the incidence of symptomatic congenital toxoplasmosis was 5/10,000 (REF). Most cases (over 75%) of fetal toxoplasmosis are asymptomatic /subclinical, but when affected, the fetus may show CNS disease, intracranial calcifications, chorioretinitis, and systemic disease with hepatosplenomegaly, lymphadenopathy, hyperbilirubinemia, seizures, rash, myocarditis, pneumonitis, an erythroblastosis picture (erythroblastosis is a severe neonatal hemolytic anemia-like Rh disease- that can result in hydrops fetalis). Lymphocytosis has been described. Diagnostic screening is by dot/blot IgM test; PCR is used in antenatal diagnosis. Treatment is given over 12 months and includes pyrimethamine, sulfadiazine, and folinic acid. Congenital toxoplasmosis is another tempting choice as the culprit in our case. Wrap-up: The paucity of clinical data given in this case makes choosing a diagnosis difficult. Nevertheless, due to the absence of widespread disease signs and symptoms- (so called TORCH syndrome =toxoplasmosis, other agents, rubella, cytomegalovirus, and herpes simplex) leads me to dismiss congenital toxo. Despite the infrequent occurrence of symptomatic congenital Chagas disease (as well the almost non-existence of case reports from the US), I will submit congenital Chagas as the cause of disease in baby TWiP 161. Patent ductus arteriosus: present in ~30% of pre-term infants. Besides prematurity, PDA is also associated with congenital heart malformations, genetic disorders, also associated with a variety of prenatal infections such as rubella, chorioamnionitis, tuberculosis. Untreated, PDA can result in pulmonary hypertension and heart damage. It is treated with indomethacin and other non-steroidal anti-inflammatory drugs (which here act via prostaglandin inhibition). Drug resistant PDA can be managed surgically. I suggest that PDA in our patient is a fellow traveller, an epiphenomenon of the overall infection. I could find no specific parasitic disease associations with PDA. Forgive these lucubrations, and thanking TWiP professors for their patience. **Massive edema, pleural and pericardial effusions and peritoneal spaces characterize hydrops fetalis. **Fetal hydrops was defined as the presence of fluid collection in ≥2 body cavities: ascites, pleural effusion, pericardial effusion, and skin edema. Clinical characteristics and perinatal outcome of fetal hydrops, Wonkyung Yeom et al, Obstet Gynecol Sci. 2015 Mar; 58(2): 90–97. This is a comprehensive, open access review of the topic with an extensive reference list. **The term hydrops fetalis describes the excessive fetal fluid accumulation in at least two serous cavities (abdomen; pleura; pericardium) or in body tissue (subcutaneous edema) Nonimmune hydrops fetalis: A short review of etiology and pathophysiology, Bellini C, et al Am J Med Genet 2012 Part A 158A:597– 605. -This review goes into insane detail in explaining the mechanism of these pathologic fluid accumulations. John Whitridge Williams 1912 textbook “Obstetrics”, employs the term “general dropsy of the fetus” -also the title of Ballantyne’s famous 1892 monograph (open access). I could find the word ‘hydrops’ used as early as 1805 in Jahresbericht Geburtshilfe und Gynaekologie. The term ‘dropsical effusions’ has been used in old medical works to describe effusions of the pericardial, pleural and peritoneal variety. A 2017 study of NIHF from southern China looked at 427 cases and only 7 of these were related to infection, primarily parvovirus B19 and CMV. A list of conditions that have been associated with fetal hydrops follows: hemolytic disease of the newborn; fetal maternal hemorrhage; alpha-thalassemia; twin transfusion syndrome (discordant hydrops, usually affecting the recipient twin); multiple gestation, with 1 “parasitic” fetus (hydrops affecting the parasitic twin, but perhaps also the “normal” twin); achondroplasia; cystic adenomatoid malformation of the lung; pulmonary lymphangiectasia, with or without other anomalies; cardiopulmonary hypoplasia, with bilateral hydrothorax; multiple congenital anomalies; maternal diabetes mellitus; dysmaturity; toxoplasmosis; cytomegalovirus disease; syphilis; leptospirosis; Chagas’s disease; congenital hepatitis; fetal neuroblastomatosis; congenital nephrosis; renal-vein thrombosis; chorionic-vein thrombosis; umbilical-vein thrombosis; and finally, no apparent cause (idiopathic). A simple and easily digestible review article. Good table (Table 1) outlining the etiologies and mechanisms of nonimmune hydrops. Infection is listed as causing 5-7% of cases, with the following mechanisms of pathologic fluid accumulation: anemia, anoxia, endothelial cell damage, and increased capillary permeability. Their definition: hydrops fetalis is a Greek term that describes pathological fluid (“ὕdur,” Greek for water) accumulation in fetal soft tissues and serous cavities. The features are detected by ultrasound, and are defined as the presence of 2 abnormal fluid collections in the fetus. These include ascites, pleural effusions,pericardial effusion, and generalized skin edema (defined as skin thickness >5 mm). Etiology and Perinatal Outcome of Nonimmune Hydrops Fetalis in Southern China, Sheng He, PhD, AJP Rep. 2017 Apr; 7(2): e111–e115. Paper is a review of 482 cases, only 7 were of infectious etiology (parvovirus B19 and CMV). Non-Immunologic Hydrops Fetalis: Study of 86 Autopsies, Garcia, A. et al (1996).. Tropical Doctor, 26(2), 78–79. 1996. Discussion restricted to Parvo B19, HSV, CMV, toxoplasma, Treponema pallidum (an accompanying table also mentions coxsackie, adenovirus, polio,rubella, flu B, RSV,Listeria, Leptospira,T. cruzi, Chlamydia, Ureaplasma. Mechanisms of hydrops generation: infection of erythroid precursors, direct hepatic damage, myocarditis. no mention of hydrops, abnormal fluid collections. Review that includes everything but the proverbial kitchen sink. Sadly, the word ‘hydrops’ never makes an appearance. Review of 11 cases. The neonates did not have detectable plasmodium in their blood. Case series from southern Saudi Arabia and Cairo Egypt. All had ascites and enlarged placentas. The authors state that “malaria has not been previously investigated as a cause of hydrops fetalis. Congenital malaria in a neonate: case report with a comprehensive review on differential diagnosis, treatment and prevention in Indian perspective, Preeti Rai, J Parasit Dis. 2015 Jun; 39(2): 345–348. An open access, readable, solid clinical review. The frequency of congenital toxoplasmosis as determined by newborn screening programs in South America varies in rates of 0.6% reported in Colombia to 0.01% in some regions of Brazil. This frequency is at least 10 times higher in most of the studies performed in South America than in those reported in Europe and United States. The author also states that congenital toxo is more severe with more abnormalities (i.e. ocular and intracranial) reported in the South American cohort. Incidence of Symptomatic Congenital Toxoplasmosis During Ten Years in a Brazilian Hospital, Bischoff, Adrianne Rahde MD, The Pediatric Infectious Disease Journal: December 2016 – Volume 35 – Issue 12 – p 1313–1316. This large study from a pediatric university hospital looked at all synmptomatic congenital cases over a ten year period. The mean incidence was 5 symptomatic cases/10,000. Prenatal diagnosis of congenital Chagas’ disease (American trypanosomiasis), Okumura M et al,Prenat Diagn. 2004 Mar;24(3):179-81. Congenital Trypanosoma cruzi Transmission in Santa Cruz, Bolivia, Bern, C., et al. (2009). Clinical Infectious Diseases, 49(11), 1667–1674. Very complete discussion including good clinical, epidemiological and diagnostic information. Not much clinical information. States that most cases of congenital Chagas are asymptomatic. Congenital Transmission of Chagas Disease — Virginia, 2010, Raul A. Lazarte, MD, et al, MMWR, July 6, 2012 / 61(26);477-479 open access. Azogue, E.et al Congenital Chagas’ disease in Bolivia: epidemiological aspects and pathological findings. Trans. R. Soc. Trop. Med. Hyg.1985. 79, 176–180. Not much clinical information regarding the affected infants. Describes striking ‘placental edema’…329 infants studied of whom 25 were positive for T cruzi (7.6%), maternal serological positivity was 51%, T. cruzi detected in 6% of placentas. This is a seroprevalance study with no clinical descriptions of the infected neonates. Congenital Chagas transmission rates average in the 5% range in South America. The authors note that very few cases of congenital transmission have been described in North America, despite the large number of potentially chronically infected mothers. (See above MMRW 2012 ref. that describes the first US congenital Chagas case. A case of a still-born dropsical foetus with a slightly oblique reference to the ‘theory of maternal impressions’ as an explanation of fetal pathology / teratology (Channing however, remains neutral in his clinical descriptions.) Recall the story of ‘the elephant man’, where John Merrick’s mother allegedly was frightened by a rearing elephant on a London street. Case V. I know nothing of the labor in this case. During a winter term, a preparation was sent to me from the country, and described to be of very curious interest, as a monstrosity which had been produced by the imagination of the mother. The story was this. A sea-captain had returned from the West Indies, and brought with him a very large turtle. He had the animal carried to the house, and deposited him in the yard for safe keeping. His wife being then in the middle period of pregnancy, had not heard of the arrival of this guest, and encountered him as he was lying and sunning himself on the door-step. As she approached, he projected his limbs from the shell and moved off. She was exceedingly frightened. She went, however, her full time, and was delivered of a most misshapen mass, which was believed by every body to be the turtle. The weather was very cold, and for safe keeping, the monster being dead, was put into a room where it was soon frozen solid, and in this way preserved its shape perfectly. In this state it was sent to me. It soon began to thaw, and after remaining one night in my warm room in the college, I found in the morning that it was a dropsical foetus, entirely put out of shape, and I may add out of countenance, by the water which filled every part of it. The skin soon gave way, the water escaped entirely, and nothing remained but a loose bag of bones. I have stated this case as showing how extensively dropsy may exist in the foetus. Hydrocephalus, existing alone, has been referred to —then as complicated with ascytes—while this last case shows the universal occupation of the foetal body by water. It is a wet and cold 43 F here in Stonybrook long island. for this weeks case I would guess that the woman that Daniel saw was infected with Chagas disease. the parasite is commonly found in Bolivia, can go for long periods of time without detection and can cause pericardial diffusion according to this paper I found. https://www.ncbi.nlm.nih.gov/pubmed/17339570 so I think guess makes sense. If the poetry book is still on the table I would like to be put into the running for it , if not well I guess Ill have to go buy it. Lastly, I took some pictures of parasites from a 3 spined stickleback this week and because I know all of you enjoy pictures (especially Dickson) I thought I would share them with you. I’m not super talented with a camera so I apologize for the amateur quality, regardless I still think the pictures look cool! 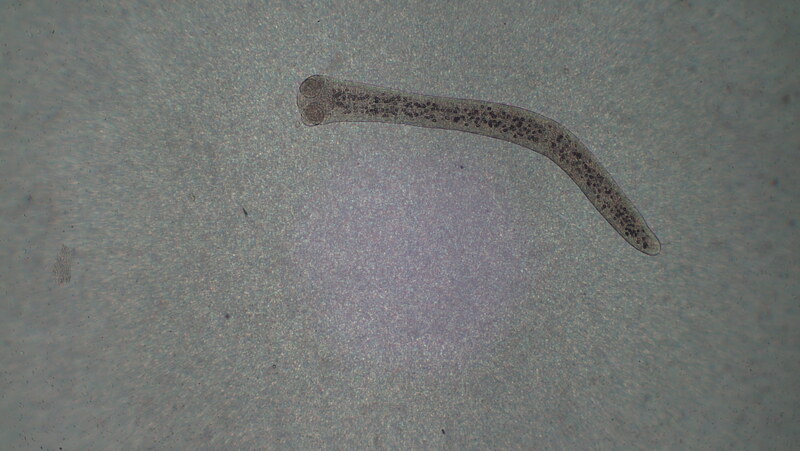 pic 3->tapeworm parasite specifically a Proteocephalus sp. also found in the intestine this one is about 3mm about I have found these to be anywhere from .5mm-20mm depending on development when caught. I normally find anywhere from 1 to 40 proteocephalus in each fish. pic4-> this is a Diplostomum pseudospathaceum which is a trematode parasite. these are located in the eye of the fish and are about .5mm long. i normally find 1-12 of these in the eyes of the fish. Hope you enjoy the pictures, sorry for not going to species level for all the parasites, we are still working on the stains for some of these to ID them further. It’s a typically wet and chilly start to the winter season in north Georgia, and the only pleasant place to be is indoors. I’m most tempted to say the parasite affecting the child in this case was congenitally transmitted, because of the travel during pregnancy. And among likely infections, Toxoplasma seems the likeliest. If the mother has never been exposed to the parasite before, she will be unprotected and the tachyzoite stage can migrate to her fetus. The cardiac symptoms and ascites are consistent with Toxo; infections early in pregnancy produce more severe symptoms or even death. The mother may have contracted this infection by accidentally consuming sporulated oocysts in the environment, or tissue cysts in under-cooked meat. 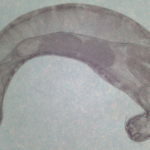 Diagnosis can be made by serological testing, and the parasite can be treated in the child, but not completely cleared. For newborns, treatment with pyrimethamine, sulfadiazine, and leucovorin for a year is recommended. I mean TWiPsters. It is sunny and 66F in Atlanta today. This episode’s case presentation of the newborn with cardiac issues and abdominal fluid threw me for a loop. I have never researched neonatal parasites outside of toxoplasmosis, so my first thought was: it’s toxoplasmosis! Right? Wrong…I think. Most congenital parasitic infections are asymptomatic and are difficult to diagnose, but after consulting PD6 pdf for congenital parasitic infections I was tempted to look further into congenital Trypanosomiasis cruzi. This was a strange choice seeing as it was the diagnosis of the last patient, but I could not shake the thought and ended up finding a case—which I will link below—that showed similarities in symptoms of ascites and pericardial effusion. Even more, the mother spent several months in endemic Bolivia prior to giving birth, as did our TWiP patient. While toxomplasmosis is a possibility, I will put my money on Trypanosomiasis. Diagnosis would best be achieved by microscopic examination of umbilical cord blood and testing the mother. She may have become infected while travelling to Bolivia or suffering from unknown chronic Chagas disease. Either case could lead to transmission to the baby. Benznidazole or nifurtimox have been shown to be effective treatments in congenital Chagas cases and would help prevent lifelong chronic infection. While sad, it is perhaps for the best that the child was symptomatic and treatment is an immediate option. The patient should be monitored post treatment to ensure the acute infection was treated completely and if not too advanced herself, the mother should seek to start treatment to prevent worsening chronic infection. I enjoyed this challenge and I am interested to hear the resolution of this case! p.s. There does not seem to be a whole lot of information on congenital parasitic diseases and I had to dig around for quite a while to find even this much. Perhaps we could spend some more time in the future on these types of cases? I think this patients is suffering from Chronic Chagas Cardiomyopathy. Chagas Disease (CD) results from infection with the hemoflagellate Trypanosoma cruzi. This cardiomyopathy is one of the late manifestations of heart involvement in CD. I found online that a left ventricular apical aneurysm is the most common echocardiographic abnormality seen in these cases. Typical findings include various heart blocks like right bundle branch block (like in our case), fascicular block, and complete heart block. To complete our diagnosis, we would need serological evidence of infection or tissue isolation of T. cruzi. I am thrown off by the fact that he already had an implantable defibrillator and was treated by a cardiologist BUT because the physician lived in a non-endemic areas this may have caused a misdiagnosis. Please see attached the research paper that I used for all the fancy medical terminology and to find out the prevalence of T. cruzi in Brazil. P.S: If I am wrong I am going to be devastated because I really wanted to get the book! By the way, I am with my classmate, who’s also a Microbiology major, and he thinks I am huge nerd for doing this. Major in Microbiology | Minor in Spanish Lit. and Cult. First let me thank you for such an engaging and informative podcast! I work in animal husbandry but have always had an intense interest in parasitology, especially fish parasitology, which has served me well working in the applied science of animal care in public aquaria and zoos. Regarding the message on your last show regarding the paucity of female parasitologists as role models, I wanted to bring to your attention the contributions of Dr. Ida Mellen who was an ichthyologist and biologist at the New York Aquarium and later at Woods Hole in the early 20th century. Dr. Mellen worked for many years at the New York Aquarium where her work laid the foundation for modern veterinary medicine of aquatic animals. She resigned without explanation in 1929, while we may never know the cause of her departure, reading the annals of the institution where the research exploits of her male counterparts were described in great detail, referring to the recent publication of “Dr. so-and-so” …we can only imagine her displeasure at having her own accomplishments minimized and attributed to “Miss Ida Mellen”. We can only speculate at the male-dominated culture she must have had to overcome as one of the nation’s first female marine science PhDs, but her accomplishments are still known in the fields of fish parasitology and veterinary medicine. Arguably the most insidious metazoan parasite of marine fishes bears her name, Neobenedenia melleni, (Monogenea: Capsilidae) which is still problematic in public aquariums and aquaculture nearly a century after she discovered it on the eyes of aquarium fishes! p.s.- an email on your last show mentioned a common saying in human medicine is also used in veterinary medicine, but you may find it interesting that “when you hear hoofbeats, think horses….” is also commonly used by taxonomists, I first encountered it in an ichthyology course in reference to identifying problematic specimens which are much more likely a common species than a rarity. How about branching out into plant and insect parasitism to broaden the podcast’s horizons? This is the first I’ve heard of a plant seeking out insect structures to parasitise. Particularly interesting that its a parasite of a parasite too. Where the weather has dropped out of blazing summer just in time to give the standard cold and wet August Bank Holiday weekend! Once a day, I walked past some feeding stations setup for outdoor cats. I did not notice what was happening. Rather recently, a volunteer feeding the cats told me that “I think that my leg is covered with fleas.” I noticed that the distribution of the fleas matched the area of irritation on my leg. (I don’t know where cat fleas lurk, but it’s interesting that they just make there way to an area that’s feline height.) I checked my leg the next time I was outside and of course there were the little monsters. I never had seen any hint of fleas when I removed my socks in the evening. Presumably, the fleas hop off after eating — to annoy later the indoor cats and then die from Frontline. We managed to get Frontline on a couple of the more approachable outdoor cats. I now spray with Pyrethrin as soon I get inside after walking by the cat feeding stations. The situation is coming under control.